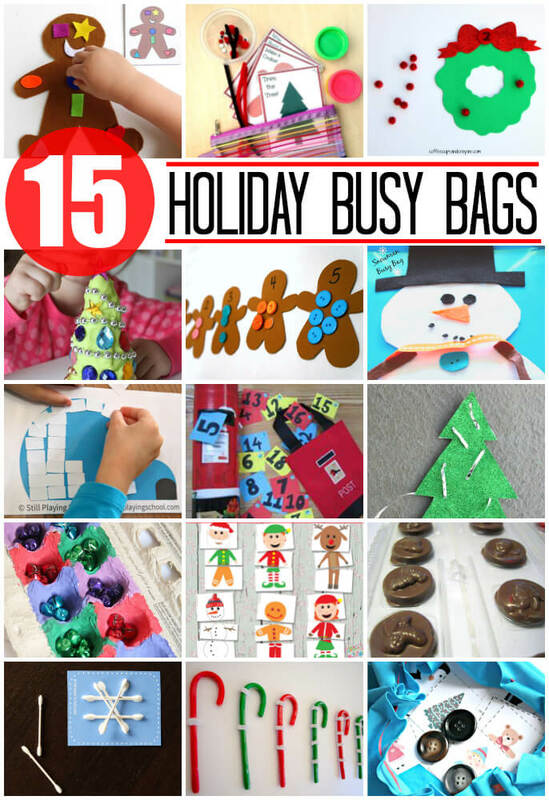 We love a good busy bag, and holiday themed busy bags are such fun! I recently made a Glitter Christmas Tree Busy Bag that has my kids working on fine motor skills, while decorating a sparkly Christmas tree! Cut a tree shape from glitter paper and use it as a stencil to cut the same tree shape from posterboard or the back of a cereal box. Glue the paper to the posterboard, You could just use the glitter paper, but it will be sturdier with the backing. Then I used a screwdriver to poke holes in the tree. O got out some wrapping paper ribbon to lace through the holes. To keep the ribbon from shredding I rolled the end of it and taped it with clear tape. Add in ribbons with different colors for more fun! Sometimes I tape one end of the ribbon to the back of a lacing toy, so the whole ribbon doesn’t come out and frustrate little fingers trying to restart the whole thing.